BRAND NEW ROADMAC SERIES OF MOBILE ASPHALT / BITUMEN MIXING / TAR MIXING PLANT FOR BITUMINOUS MACADAM / PREMIX (DESIGN COPYRIGHTS) AVAILABLE FROM 30TPH TO 120TPH. Leo Road Equipments P.Ltd is D&B certified and a State of the art company located at Ahmedabad, Gujarat, the industrial Hub of India. 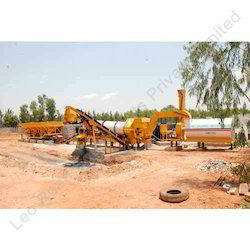 The company was established in 1996 and Today, Leo Road Equipments is the Pioneer manufacturer of Mobile Drum Mix Asphalt plant up to 120TPH /Mobile Wet Mix Macadam plant up to 200TPH in India AND HOLDING Design copyrights for various models / capacities. Brand new roadmac series stationary drum mix asphalt plant /asphgalt plant model –roadmac-50 cap 60-90tph with following salient features.